Past Alaskan Trips | Alaskan at Last! As I prepare for my next great adventure to pick up my R-pod from a rural farm in Three Forks, Montana I thought perhaps I should finish clearing out some of more memorable images from my Alaskan life and visits. Included in this collage is an image taken on The Alaska Highway in British Columbia during my relocation trip from SE Michigan to Talkeetna. I mention it only because technically it isn’t Alaskan weather or Alaskan skies but it was tied to moving up here. I hope to be able to share some amazing images from the majestic provinces of Alberta, British Columbia and The Yukon Territories as well as from Montana and, of course, Alaska. Here’s to the wonder and majesty of Nature regardless of its location! Smoke from my burn barrel slowly drifts upward as my German Shepherd Dog – Qanuk – heads out to visit me while I’m burning paper and cardboard which are two items not recycled in the Talkeetna area along with glass. A cold afternoon at the Tesoro gas station located at ‘the Y’ which is formed by the Spur road intersecting the Parks Highway (AK 3). An October sunrise from my front porch featuring the very common pastel pinks and oranges. A September sunset over the northern portion of Cook Inlet reveals the Aleutian Range mountains of the west side of Cook Inlet. The ‘big sky’ effect so common in the plains of Canada and across the provinces pushing up against the Rocky Mountains. 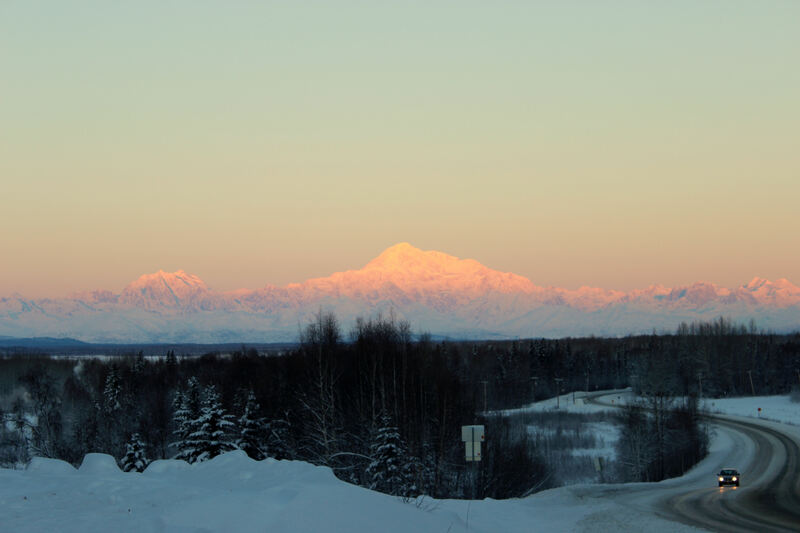 Long shadows etched into the Kenai Peninsula are created by the Kenai Mountains and the setting sun. 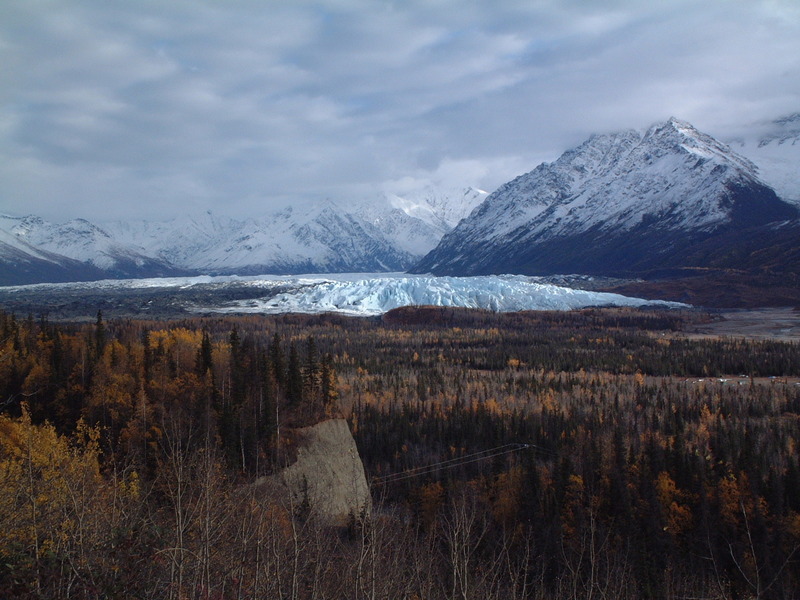 The toe of the mighty Matanuska Glacier as seen from a pull-out along the Glenn Highway (AK 1). The remnants of ice fog ablaze in the afternoon sun on Riven Street. Sunset on Question Lake which is just a few hundred feet from my house and home to a myriad of waterfowl and other Alaskan ‘critters’ year ’round. A valley in the far distance – located center right in this image – is visible as a break in the low clouds along the Dalton Highway (AK 11). A faint rainbow is just visible over a section of tussock tundra just west of Savage River basin on the Denali NP&P road. Although very wimpy by lower 48 standards these are some of the few mammatus clouds I’ve observed in Alaska. These buried mailboxes along the Spur bear witness to the heavy snow Talkeetna sometimes sees as well as the dearth of wind during such occurrences. The glaciated Kenai Mountains form the backdrop to this image of Homer Spit – in the lower left of the image – thrusting 4.5 miles into gorgeous Kachemak Bay. A favorite of mine, this image shows Anana and Qanuk wandering East Barge Drive amid the majestic fall color. The awesome beauty of the Mendenhall Glacier reflected in Lake Mendenhall. Denali and The Alaska Range bisected by split layer clouds as seen from The Alaska Range overlook just a few miles from the village of Talkeetna. Spectacular Mt Redoubt, an active strato-volcano in the Aleutian Range, as viewed from around Kalifornsky on the Kenai Peninsula. If you look very closely there’s a float plane just visible in the air to the right of the volcano’s peak. 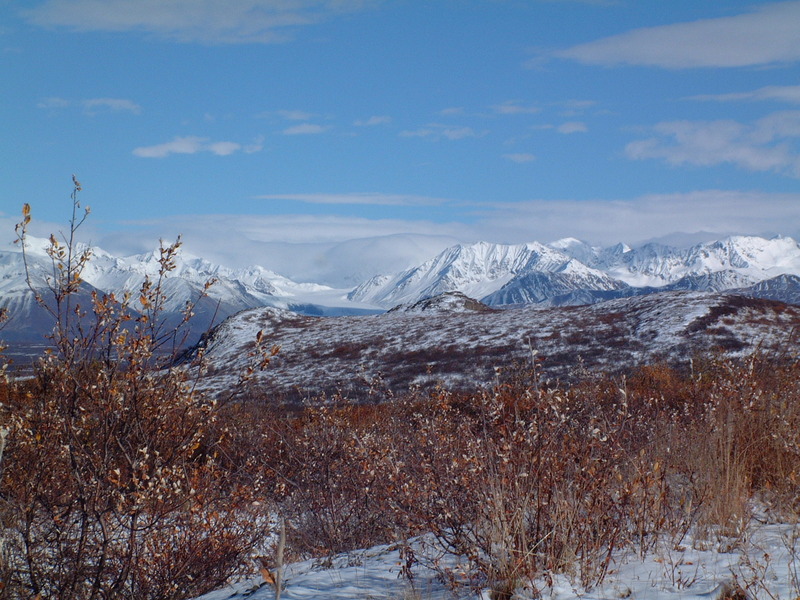 This is Gunsite Mountain just north of the Glenn Highway. If you look closely at the ‘dished’ area you will see a tiny square notch with the overcast gray sky visible beyond; hence the mountain’s name. Savage River Basin in Denali NP&P on an early September afternoon. The taiga and tussock tundra are in full fall color; this image has not been manipulated in any manner and I wasn’t using any special filters. It is just this colorful! I spied this ‘Little Cloud That Could’ on the Parks Highway just outside Houston. I don’t know if the rain was reaching the ground but I’d never seen just a single small cloud in an almost clear sky trying so hard to make rain! Hill side fall color along the Elliot Highway (AK 2) between its junction with the Dalton Highway (AK 11) and Fairbanks. Notice the small line of orange colored trees just a bit above and left of center; such color is rare up here due to a dearth of hardwood trees. Classic thunderstorm out-wash above the float plane docks on Fish Lake around Mile 9.5 on the Spur. The thunderstorms were forming along the Talkeetna Mountains to the east. A fiery red sunset over Kachemak Bay as seen from the front porch of a magical little cabin in Kachemak Bay SP&P named ‘Timbers’. The same view as above but on a different day and time. The incredible Aurora Borealis as seen from a neighbor’s place perhaps six miles north of my home. The late fall/early winter of 2016/2017 featured amazingly clear skies and intense auroral activity. Many nights I lay in bed and just watched ‘Nature’s Light Show’ for hours. The eastern Alaska Range as seen from a pipeline access pull out on The Richardson Highway (AK 4) maybe thirty miles south of Delta Junction. It was early September of 2000 when this image was captured looking SSW and a brief snow event had occurred across the night. Split layer fog is relatively common in Alaska and this is a classic shot of said weather phenomena. Just left of center is the Alyeska pipeline with the road splitting off to the right. 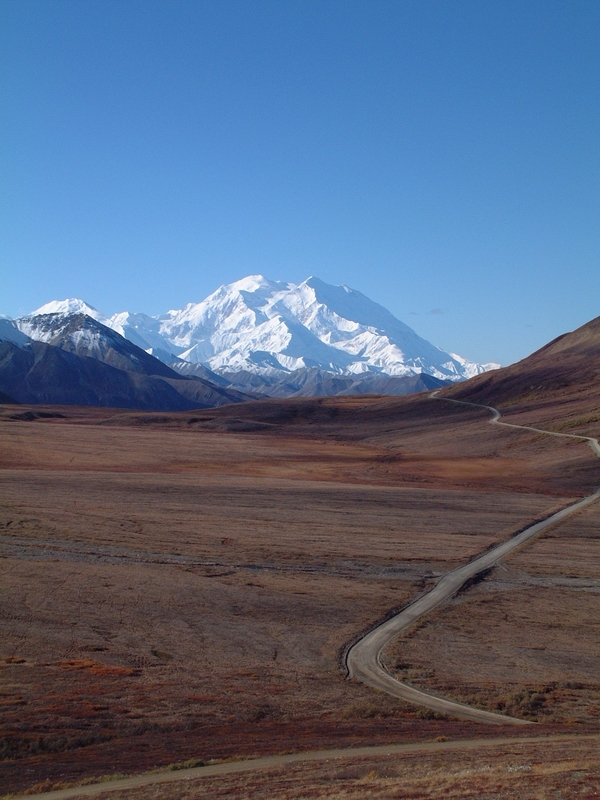 This was taken somewhere along the Dalton Highway (AK 11). 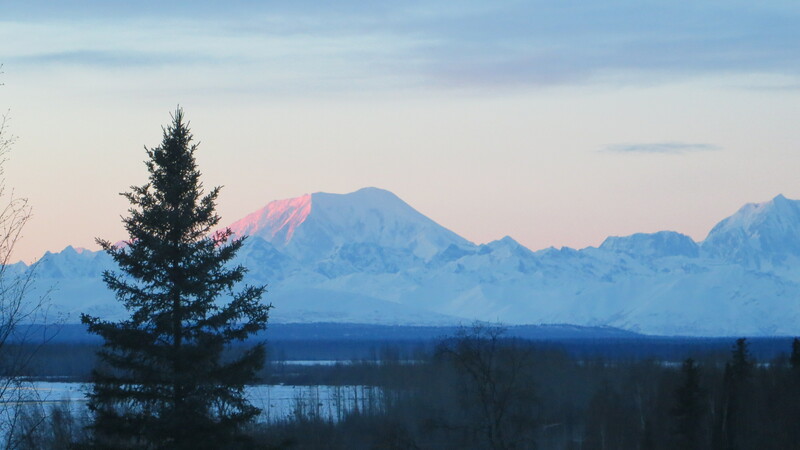 Mighty Mount Foraker (17,400 feet in elevation) is tall enough to form its own weather as evidenced by the lenticular clouds forming above its peak. This image was taken from the Spur around Mile 5. A ‘molten’ orange-red sunset taken from a pull-out along the Dalton Highway (AK 11) just a bit north of Coldfoot. A majestic early September sunset above Mount Illiamna which is a four peaked active ‘strato-volcano’ exceeding 10,000 feet in elevation. The image was taken at Stariski SRS and is looking west across Cook Inlet. The huge Alaskan sky as seen from a gravel pit pull-out along the Dalton Highway (AK 11). My buddy was using his video camera to capture the same ‘big sky’ effect. It’s Alaska so ya gotta have one image of snow falling, right..? This was taken in January of 2017 as I was driving south down the Spur from the village to my home. 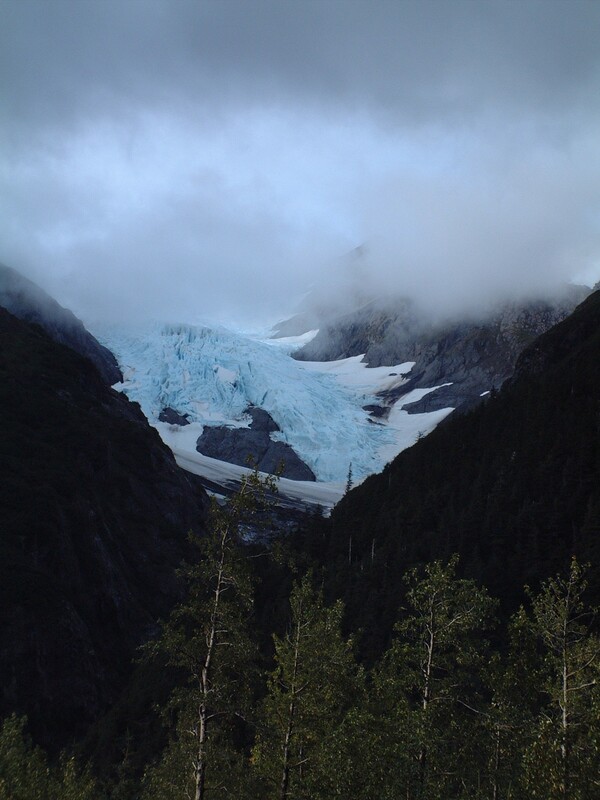 Close up of an unknown glacier in the Kenai Mountains with a thick cloud layer almost cutting off the tops of the mountains; the image was taken from the foothills around Homer and looking across Kachemak Bay. 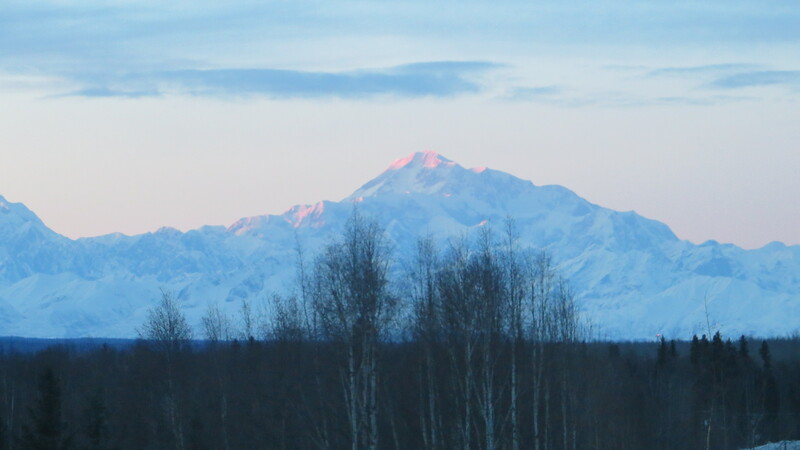 Mighty Denali (20,287 feet in elevation) cloaked in morning Alpenglow as seen from the famous overlook on the Spur. 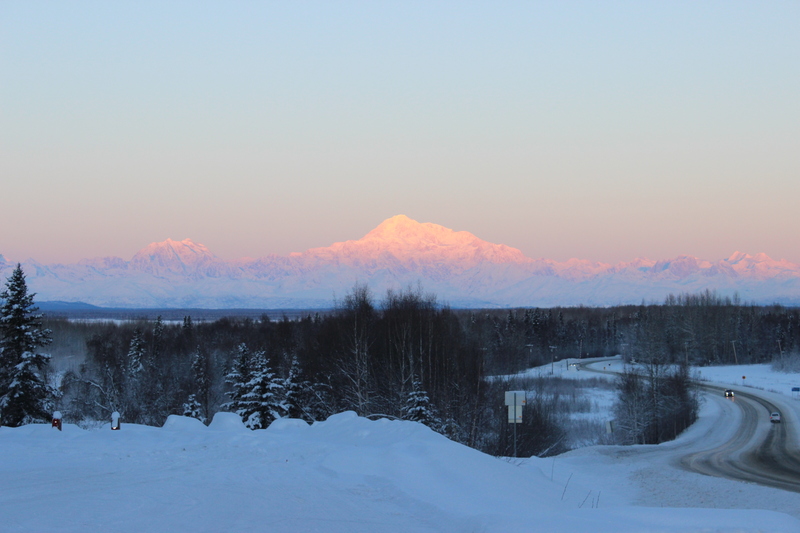 From this point the village of Talkeetna is just another couple miles up the road. One of the events I cherish in my new home is viewing true ‘alpenglow’ up here in ‘The Last Frontier’ and to this point I’ve seen some marvelous examples of the effect. To those unsure true ‘alpenglow’ is caused when the sun is just below the horizon – this can occur just before sunrise or just after sunset – such that the more energetic (i.e. higher frequency) portion of the visible light segment of the electromagnetic spectrum isn’t bent enough by the earth’s atmosphere and radiates into space while the less energetic (i.e lower frequency) portion – in this case the reds – are bent just enough to strike taller objects like mountains. The phenomena is always very short duration and requires a clear atmosphere. 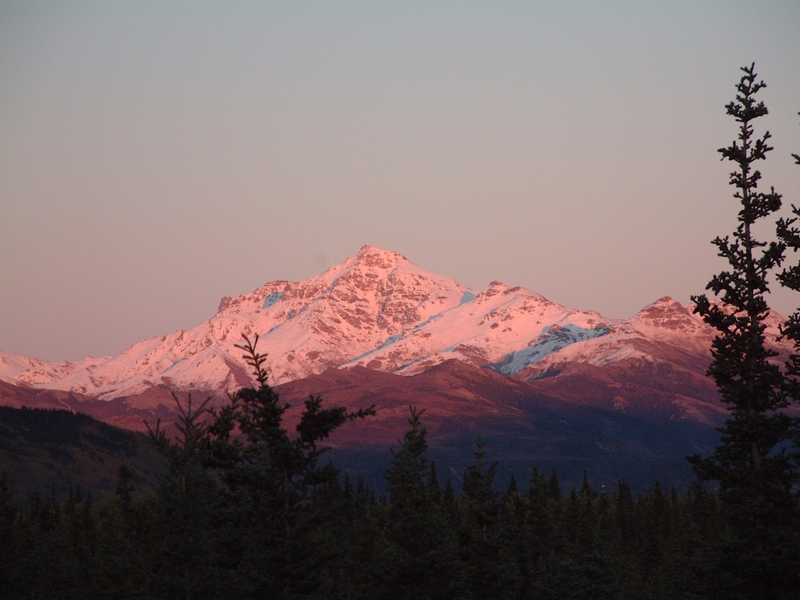 There are other instances of a pink to red light striking mountains which technically do not meet the above definition but are also referred to to as ‘alpenglow’. While I prefer the images of true alpenglow I have included a number of examples of both effects in the following pictures. This effect is just one more demonstration of the incredible natural beauty that truly makes ‘The Great Land’ unique and so memorable! The Alaska Range is full of glaciers and there’s an unnamed glacier sweeping down from The Alaska Range foothills in this image taken from the Paxson end of the Denali Highway (AK 8). This image was taken in early September of 2002 and although it was snowy and cold in the immediate vicinity of the mountains just getting a few tens of miles to the north or south saw sunshine and air temps in the fifties. Not All Glaciers Are Snowy & White! 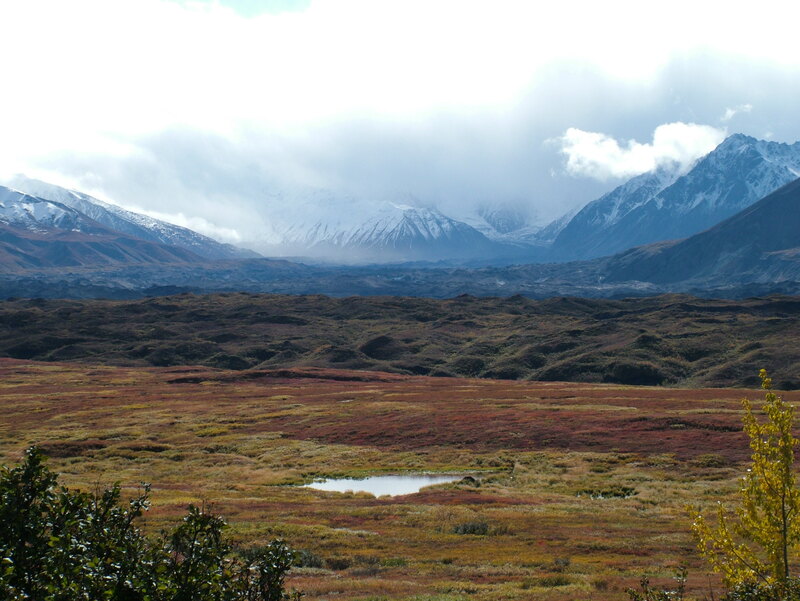 Just beyond the fall color tundra lies a portion of the Muldrow Glacier in Denali NP&P; it is the dark colored undulations that fade back towards The Alaska Range. This glacier originates from Denali and is the landing field for the bush planes transporting mountain climbers for an attempt to summit Denali. 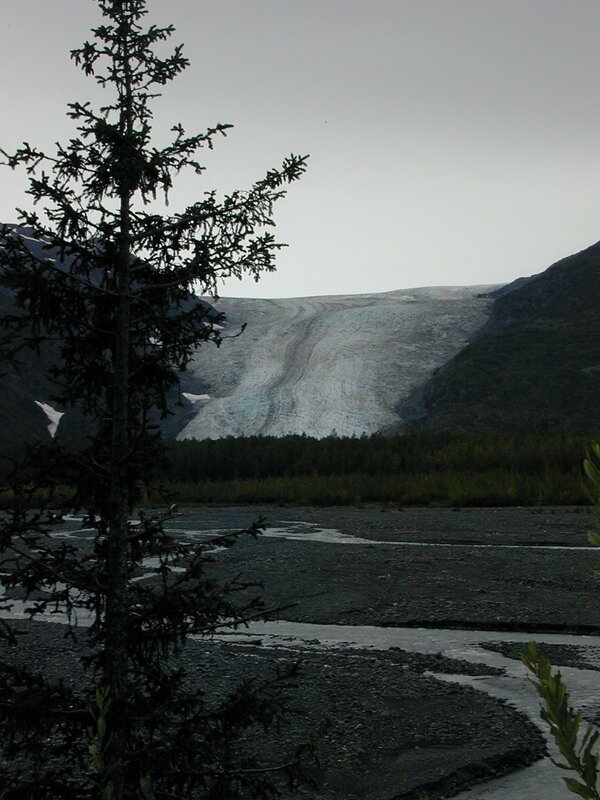 At one time this portion of the glacier was snowy and white but over time the winds in the Park have blown considerable soil onto the glacier and then local fauna has taken root and is actually growing on the soil covering the ice and snow. An amazingly red sunset caught from the front porch of a magical little cabin named ‘Timbers’ which is nestled along Halibut Cove on a small piece of private land amid the magnificent scenery of Kachemak Bay State Park. This cabin and park are accessible only by water or air and are located across Kachemak Bay from the little town of Homer.